Medical oncologist Anas Younes leads an ambitious effort to find disease biomarkers that could predict which lymphoma patients will benefit from new targeted therapies. 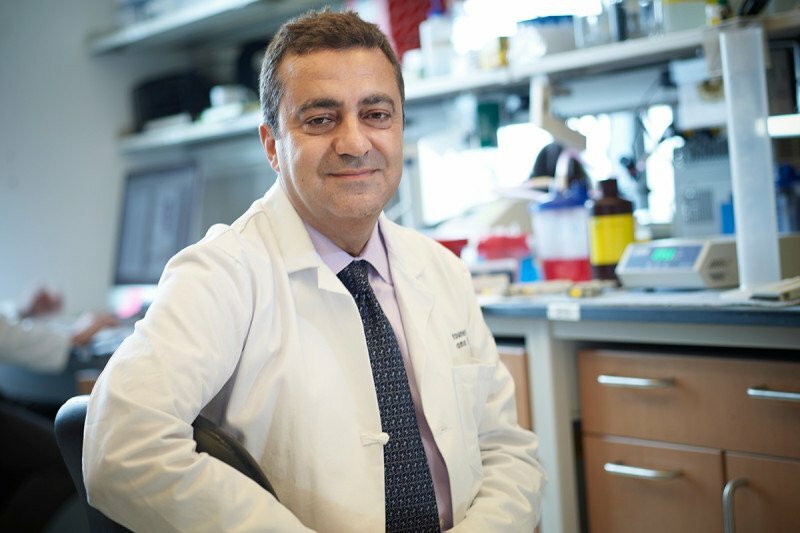 As Chief of Memorial Sloan Kettering’s Lymphoma Service, medical oncologist Anas Younes is spearheading an intensified effort to identify new disease biomarkers that help predict which patients might benefit from new targeted therapies. 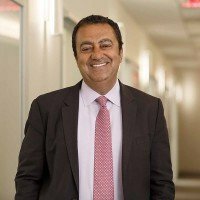 These lymphoma treatments will be tested in highly focused clinical trials for the many different subtypes of the disease, trials that Dr. Younes will advocate with his non-medical secret weapon — social media. My connection to Memorial Sloan Kettering and New York goes back more than two decades. After completing my residency in internal medicine at SUNY Downstate College of Medicine in Brooklyn, I did a hematology-oncology fellowship at Memorial Sloan Kettering. I then moved to Houston in 1992 to serve on the faculty at M. D. Anderson Cancer Center. Twenty years later, earlier this year, I came back! I was drawn back to Memorial Sloan Kettering for two main reasons. First, the outstanding collective clinical expertise in diagnosing and managing patients with lymphoma is unmatched anywhere in the world. Our 12 clinical faculty members on the Lymphoma Service have a combined experience that exceeds 100 years, and each of us has managed even the rarest and most complex forms of lymphoma. There’s also a long tradition of close interaction with our outstanding pathologists, radiologists, radiation oncologists, and surgeons. I was very honored to be asked to rejoin the Memorial Sloan Kettering community and lead the Lymphoma Service. Second, and equally important, is the opportunity to collaborate with world-class scientific leaders who have made numerous discoveries that enhanced our understanding of cancer and lymphoma biology, immunology, and genetics. This environment, which brings together clinical and basic science faculty in close physical proximity, is unique in the cancer world, positioning Memorial Sloan Kettering to drive the lymphoma field forward. Finally, as much as we enjoyed living in Texas, my wife and I always felt and lived like New Yorkers. It was natural for us to return. Lymphoma was one of the first human cancers to become curable with multi-agent chemotherapy. Today, 40 years later, we still use the same drugs. They have cured many patients but remain rather nonspecific for lymphoma. Nevertheless, we give these treatments to a variety of patients hoping we can cure some of them. Working with 40-year-old drugs is like trying to sequence the human genome using your old Macintosh computer. We need to develop treatments that are more effective and safer based on recent advances in our knowledge of tumor biology. How do we accomplish this? The answer lies in our ability to rapidly translate the latest scientific discoveries into smarter, more rationally designed, mechanism-based clinical trials. The old way of selecting patients for testing of new drugs was based primarily on the histologic type of their cancer — how the cells look under the microscope. But we have recently learned that lymphoma cells that look the same under the microscope may differ in their genetic composition and in their response to any given therapy. The current treatment approach is not only slow and inefficient, it also exposes a large number of patients to toxic effects from which they may not benefit. Instead, we’ve begun taking a “divide and conquer” approach, separating lymphomas into groups based on newly identified genetic and biologic alterations in the cancer cells, and irrespective of the underlying histology. We are actively screening lymphoma tumors for new biomarkers and possible new therapeutic targets. This strategy allows us to select patients for specific therapies that are likely to be more successful. Trials conducted in this way will require fewer numbers of patients to participate so we may complete these studies and learn the results in a shorter period of time. We have already started implementing these novel trial designs to match patients with specific treatments based on their tumor biology. Our lymphoma group is collaborating with several laboratories, including Foundation Medicine, a commercial laboratory that is a leader in genetic sequencing, to develop a molecular diagnostic test that will simultaneously evaluate the status of hundreds of genes in a variety of lymphomas. Using this genomic panel, we may soon be able to offer more patients the opportunity to participate in clinical trials testing novel agents more tailored for their specific lymphoma tumors. The Lymphoma Service holds weekly clinical research meetings to discuss current and future strategies and plan new collaborations and clinical trials. Despite this progress, many tumor cells quickly learn how to outsmart a particular drug, no matter how active its effect. We are designing new combination regimens based on our understanding of the mechanisms that lead to tumor cell resistance. To improve this understanding, it is important to obtain fresh tumor cells from patients both prior to therapy and then at the point of tumor progression. Data from such sequential biopsies can benefit not only the patient, as they may guide the selection of subsequent treatment, but also the lymphoma community in general. To accelerate our progress, it is essential to find ways to reach out to patients, caregivers, and referring physicians to make them aware of some of our high-priority studies. The Lymphoma Service has a new, continuously updated web page for clinical trials that is very user-friendly. My colleagues and I are also active in using social media such as Twitter and Facebook to spread the knowledge about clinical trials and to educate the public about our initiatives. Social media is where patients and caregivers are, and many patients tell me they found their way to Memorial Sloan Kettering through Twitter and Facebook. Apart from encouraging patients to participate in clinical trials, our presence on social media outlets is a public service because we provide credible information on healthcare topics. This is an exciting time to be in medical oncology. With such a talented group of people at Memorial Sloan Kettering dedicated to working to improve the cure rate of lymphoma patients, I am optimistic that we will change the natural history of this disease. It is only a matter of time. Follow Dr. Younes on Twitter (@DrAnasYounes) and on his Facebook page. Hi Mark, if you would like to make an appointment at MSK, you can call 800-525-2225 or go to https://www.mskcc.org/experience/become-patient/appointment for more information on making an appointment. Thank you for your comment, and best wishes to you. I live in NJ and my local dermatologist suggested I see a specialist for what they believe might be mycosis fungoides. and Weill Cornell, however the physician I have chosen at Weill Cornell works ar MSK. Could you please help me make the right decision? If not, it's ok.
Dear Merrill, we’re sorry to hear you’re going through this. MSK does have specialists who treat this condition as well. If you’re interested in learning more, you can call 800-525-2225 or go to https://www.mskcc.org/experience/become-patient/appointment for more information on making an appointment. Thank you for your comment, and best wishes to you. I am Canadan & a patient @ Princess Margaret Hospital in Toronto. I was diagnosed a year ago with Non-Hodgkin follicular lymphoma stage 3. Since I feel well I am on a watch & wait approach so no treatment. I see my oncologist every 3 months after blood tests. A physician on my recent ski trip recommended Your centre. I am thinking of coming to you for a second opinion with my medical report & test results. How much would a consultation appt cost? Dear Mara, we’re sorry to hear about your diagnosis. If you’re interested in coming to MSK from Canada, you can contact our International Center at international@mskcc.org or go to https://www.mskcc.org/experience/become-patient/international-patients for more information.